Throughout history fables have been a popular method of giving instruction. Fables contain a short narrative that seeks to illustrate a hidden message. Generally, fables use animals or objects as part of the narrative yet the message is designed to apply to humans. By doing this, the fabulist is not perceived as the teacher and this reduces any bias the listeners might have against the person. The most famous fabulist would be Aesop who most date around 620 B.C. Many fables are attributed to Aesop, but it’s unclear how many he actually wrote; indeed, his historical existence as a person is under question. I’ve collected many of them here for your enjoyment. A number of translations were found and the fables collected. Several different translations and interpretations of the same fable may be found on many of the pages here; including, now and again, a simplified version I wrote. In addition to the text versions of the fables, materials from several visual versions have been incorporated into the presentation here. As one example, some of the more classic fables were, in 1887, put into verse and printed along with dramatic illustrations. Those versions are presented as “Crane Poetry Visual” summaries with the image shown at the right . Both the visual and poetic text are included on the fable pages. The specific book these came from is: The Baby’s Own Aesop by Walter Crane and engraved and printed in colors by Edmund Evans; it was published by George Routledge & Sons in London and New York, 1887. You can see a copy of the book at the Library of Congress. A series of 100 longer adapted fables have also been added from an 1828 book by James Northcote, R.A. called One Hundred Fables, original and selected. Wood engravings embellish these fables. The fables are expanded with much more text than a simple translation and several have annotations at the end that describe how the fable applies to modern (1828) times. Some of these notations are longer than the fable. Search for this book on Google Books. An illustrated book titled Some of Aesop’s Fables with Modern Instances Shewn in Designs by Alfred and Randolph Caldecott has been added. There are only 20 fables in this book but it is well illustrated. The book may be found in the Project Gutenberg archives among other places. A few fables have been added from the 1819 French book Fables de La Fontaine. Only those fables with illustrations are included here and they are in the original French. I’ve included them more for the illustrations than the French translation. You can see the whole book at the Internet Archive. New fable versions have been added from the 1811 book Aesop and Others: Translated with Instructive Applications: and a Print Before Each Fable by Samuel Croxall, D.D., late Archdeacon of Hereford. Fables on this site come from the nineteenth edition of the book. The original edition was published in 1722. You can see the whole book at the Internet Archive. 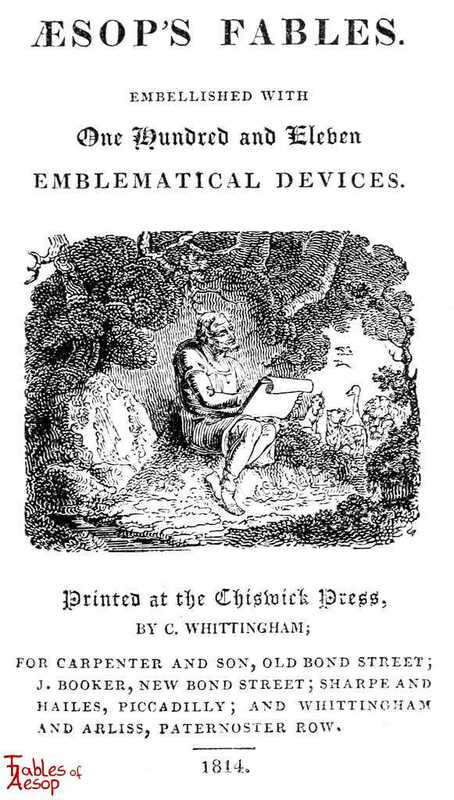 Additional artwork associated with the Croxall collection of fables is being added from the 1814 book Aesop’s Fables Embellished with One Hundred and Eleven Emblematical Devices by C. Whittingham. The second method would be to use the tag cloud. Each fable has been tagged with the animals in it so the tag listings show fables with the tagged animal in them. In addition, each fable has its moral in the listing so you can search by the moral as well. Finally, illustrations are usually presented as smaller images on the fable pages. Click on any image you are interested in and if a larger version is available it should open in a light box (please see the Terms and Conditions page for use of images and text from this site). Townsand version (search for all Townsand). L’Estrange version (search for all L’Estrange). Eliot/Jacobs version (search for all Eliot/Jacobs). Jones version (search for all Jones). Crane Poetry Visual version (search for all Crane Poetry Visual). JBR Collection [an 1874 collection edited by J.B.R.] (search for all JBR). Most older texts used ligatures throughout so instead of Aesop, you might see Æsop. Other combinations might include an “o” and “e” as œ or “a” and “e” as æ. For the purposes of readability and ability to search, all ligatures on FablesOfAesop have been turned into their separate letters. We hope you don’t mind this little historical inaccuracy.